Searching the internet, I found a little information on Carrillo for whom the trail was named. Emilio Carrillo was born in Santa Cruz, Sonora Mexico and moved to Tucson in 1856. In 1868 he started Ranching in the Tanque Verde Valley at what is now the Tanque Verde guest Ranch. In 1904 he was hung by bandits from the rafters in his home but survived the ordeal only to die 4 years later from complications of this hanging. His son Rafael took over the Ranch until he sold it to Jim Converse in the 1920’s. The upper trail was rerouted and the new section of trail was opened in 2014. The old trail use to head North from Bajada Wash and followed along the ridge to the Douglas Spring Trail, joining it on a saddle just before the Douglas Spring Trail drops down to the desert floor (N32 deg 13.852’ W110 deg 40.430’). The Park decided a new routing for the trail was necessary because the old trail was too steep and erosion was taking its toll on the trail. 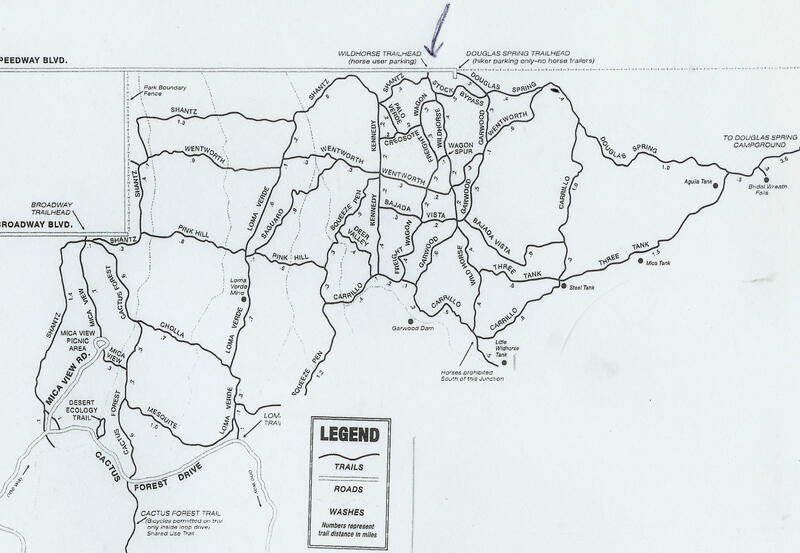 The new trail heads East at Bajada Wash and connects up with the Douglas Spring trail at a saddle just before dropping into an unnamed creek (about .4 miles further east along the Douglas Spring Trail). 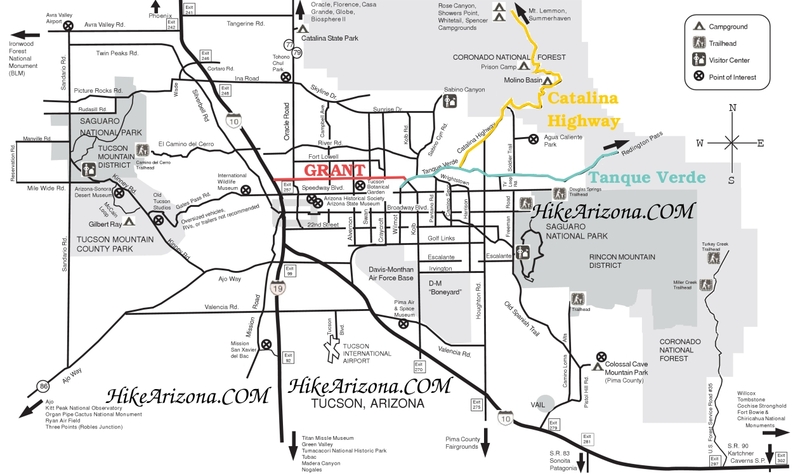 The Southern Terminus of the Carrillo Trail starts along the Squeeze Pen Trail about 1.5 miles from the Saguaro National Park, Cactus Loop Drive. The Carrillo Trail heads east crossing over to the north side of Wildhorse Creek after .3 miles, Deer Valley Trail at .4 miles and the remnants of the old Kennedy and Freight Wagon trail at about .5 and .65 miles. At .7 miles and only 100 feet in elevation gain is the junction with the Garwood trail. So far the trail has been along the desert floor and other than the Typical Saguaro National Park cactus and plants not much to see. During the summer monsoon season and winter/Spring, Wildhorse Canyon has pools of water from about where the trail crosses the stream and continuing on up stream. This would be a good place to hike further up stream to explore the creek. 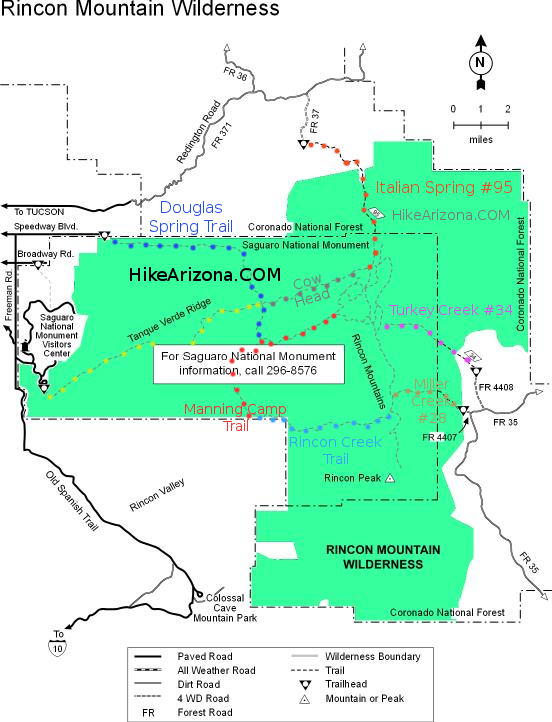 From here the trail starts climbing the lower most hills of the Rincon Mountains. The trail follows along the north side of Wildhorse Canyon about 100 to 200 feet up and crosses Wildhorse Tank Trail at 1.5 miles. Garwood Dam can be seen prior to reaching the Wildhorse Tank Trail and the Carrillo Trail passes just on the north side of this dam allowing for a closer examination. 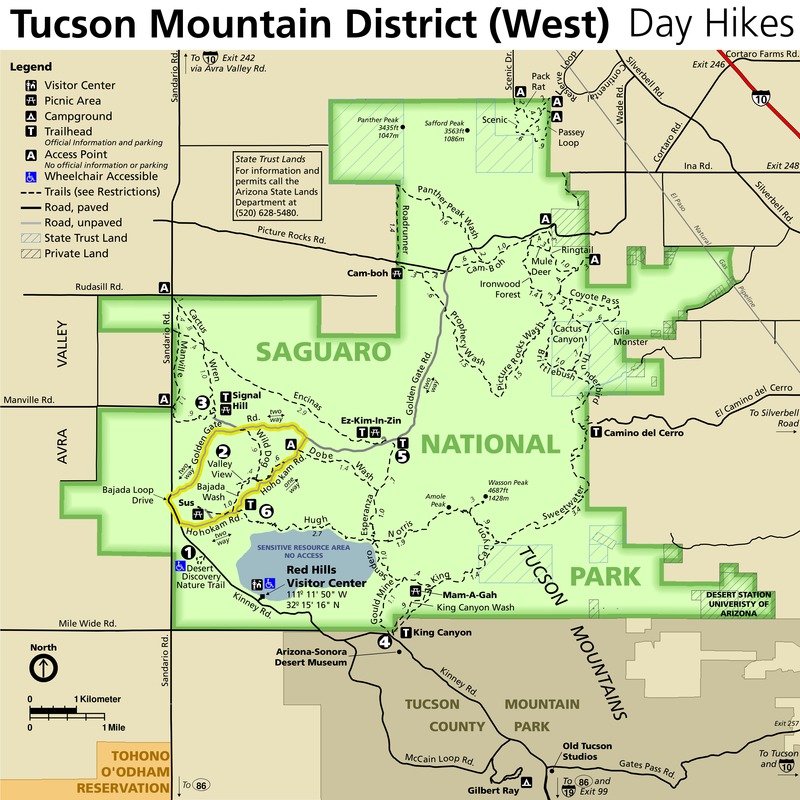 After Crossing the Wildhorse Tank Trail, the Carrillo Trail continues to climb up the lower hills of the Rincon Mountains (Tanque Verde Ridge) and at 2.2 miles the trail crosses over the Three Tanks Trail and a wash that is part of the upper Deer Valley Drainage. At this junction with the Three Tanks Trail is large steel tank that use to have water in it, in fact there use to be gold fish in it. The trail continues on and at 2.4 miles crosses the upper Bajada Vista Wash. The old Bajada Vista Trail use to head down this wash and connected up with the current Bajada Vista Trail. 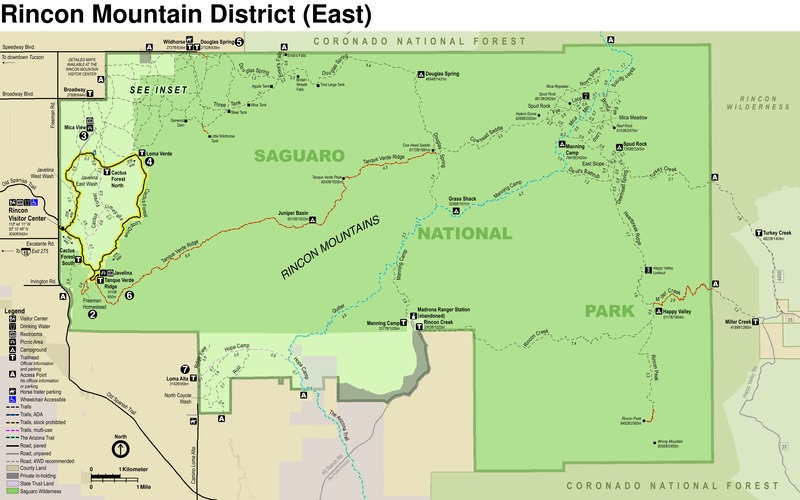 This is also where the Old Carrillo trail splits off to the north (Abandon Trail) and the new Carrillo Trail heads east and connects up with the Douglas Spring trail at the saddle just above an unnamed creek for a total of 3.2 miles. Good views to the west of Tucson Valley and Mount Lemmon from the upper Carrillo Trail. The total elevation gain for this hike is about 750 feet making this a fairly nice easy hike best done in the winter spring months. Of course if you want to do it during the monsoon months go early. The trails are well maintained and easy to follow. The only issues I have heard people say they have with the trails in this section of the park is that at some of the junctions (and there are a lot), it can be a little confusing. The trails I believe are well signed and if you can drive on the LA freeway system and not get lost you shouldn’t have a problem here. I-10 SE out of Tucson exit 267 for Valencia Rd. Turn left at E Valencia Rd follow 3.1 mi. Turn left at S Kolb Rd follow 1.6 mi. Turn right at E Irvington R follow 4.0 mi. Turn left at S Houghton Rd follow 1.0 mi. Turn right at E Escalante Rd follow 2.0 mi. Turn left at S Old Spanish Trail follow 0.3 mi. Turn right at S Cactus Forest Dr follow 3.7 mi to Loma Verde Trailhead.